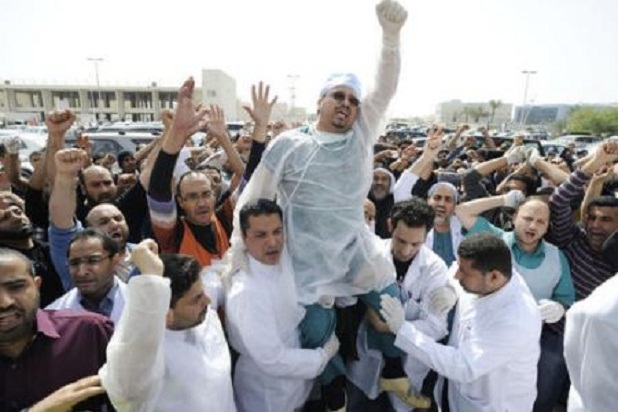 In the aftermath of violent repression in recent months, Janet Salmon reports on the growingly desperate plight of many Bahraini doctors and patients. What do Dr Ali Al-Ekri, pediatric orthopedic surgeon, Ghassan Dhaif, maxillofacial surgeon, Bassim Dhaif, orthopedic surgeon and Rula Al Safar, Head of the Bahrain Nursing Association have in common? The first three were educated in Dublin and when the democracy demonstrations were put down by Bahraini and Saudi forces in March, all were detained and tortured. On June 29th, King Hamad bin Isa al Khalifa issued a Royal decree shifting all the cases to the civilian courts from the military courts. But the twenty doctors, charged with felony, (possession of unlicensed weapons, confiscating medical equipment, spreading false news on the wounded and changing the regime by illegal means) will go to the military court on 29th September. No prosecution “witnesses” can be cross-examined and no defence is allowed. On 28th September, Opposition MPs and Human Rights lawyers go to military court with their appeals against sentences ranging from fifteen years to life imprisonment. On 24th October, a further 24 doctors go to court for misdemeanours. Eleven doctors went on hunger strike for nine days in September. Rula Al Safar and Jabila Al Salman, Vice President of the Bahrain Teachers’ Association went on hunger strike for three weeks. 13 prisoners have been temporarily released with serious health problems but are still charged. 93 detainees, out of 400 prisoners are still on hunger strike. Patients don’t go to Salmaniya hospital for their oncology tests and medical care because they’re too frightened of being detained by the police. Men with gunshot wounds are treating themselves at home as the demonstrations go on nightly. What can we, in the West, do? Ask your University, Royal College and international contacts to condemn these actions and cut connections with the regime. Contact your M.P. and Cabinet Ministers to tell the Government to put pressure on the Khalifas to release the unjustly detained doctors. Doctors should be able to care for the injured during war and civil unrest. If they fear they will be arrested, society breaks down even further. The call for democracy will move up the Gulf where the West has close business and political interests. We must act now. Please see frontlinedefenders’ petition to King Khalifa and Bahrain, Free the Docs. Janet Salmon is a consultant, writer and activist.